Sharon K. Thomas, is a long-time member of the Foothills Art Association (FAA). She joined in 1994. Over the years, she has received many awards for her paintings. She paints what she likes which makes for a very diverse amount of work. She says if one person likes what she does, she feels happy. Being an avid photographer and having a certificate of competency in desktop publishing, Thomas has used both skills as tools in her artwork. Because painting on location isn’t always possible, many of her compositions are from her own photography. As an artist for over 30 years, Thomas has made it a point to keep her work fresh by attending workshops which help her to develop new techniques. She works in watercolor, oil and acrylic. Thomas was born in Grand Rapids, Michigan. Throughout her childhood, she was always drawing and sketching. She joined the Grand Valley Artists Association in the late 1970s. In 1982, her family moved to California. She settled in Santee where she raised her four children. After they were grown, she obtained a license in real estate and continues to work as an agent. Over the years, Thomas has been active in the Foothills Art Association serving as the third vice president/chair of the Ways and Means Committee, publicity chair, board of directors, recording secretary, historian, and editor of the FAA newsletter Footnotes for five years. 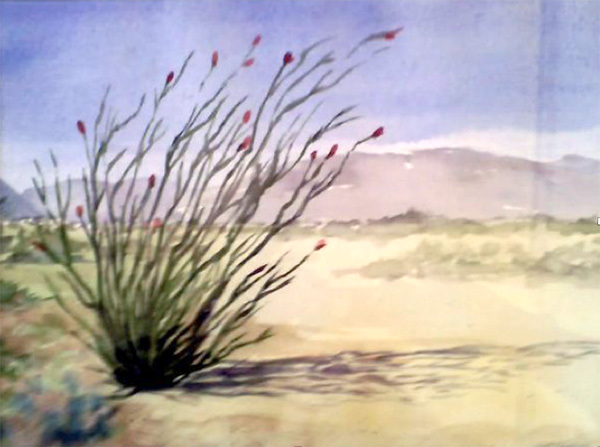 In addition to her membership in Foothills, Thomas is a juried-in member of the Southwestern Artists Association in Spanish Village, where her miniature paintings and greeting cards are available for sale throughout the year. Other memberships include: San Diego Watercolor Society; San Diego Museum of Art – Artist’s Guild; San Diego Portrait Society, East County Art Association; and La Jolla Fine Arts. Thomas’ paintings will be featured through June 6 at the Foothills Gallery at Porter Hall in La Mesa. The gallery is open Tuesday through Saturday, 11 a.m.–4 p.m., and is located at 4910 Memorial Drive, La Mesa. — Linda Michaels is editor of the Foothills Art Association newsletter Footnotes.